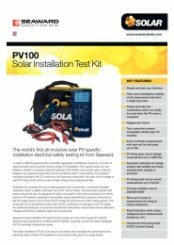 The Solar PV100 Test Kit allows earth continuity, insulation resistance, open circuit voltage, short circuit current and an operational test to be performed on a PV installation. 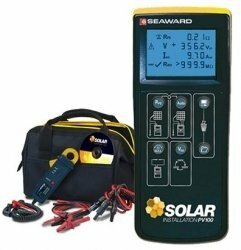 With the revolutionary new Seaward PV100 Solar Multifunction Tester and Solar AC/DC clampmeter, all these tests can be safely completed without risking damage to the user or to the solar PV panels. 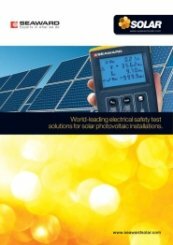 - World\\\'s first all-inclusive solar PV specific electrical safety testing kit - Seaward PV100 multifunction solar installation tester - Fulfils UK MCS and IEC 62446 requirements - Connect direct to the PV array - Simple and safe test connections even when the PV array is energised - Test connection system compatible with all major PV modules - Operational test using Solar AC/DC Current Clamp PV100 Kit includes: - Seaward Solar PV Installation PV100 Tester (388A910) - 2 x MC4 test lead adaptors - 2 x Sunclix test lead adaptors - 2 x Test lead with probe and detachable alligator clip - AC/DC Solar Current Clamp - Rugged carry bag - Quick start guide for Seaward PV 100 - Support CD-Rom - Calibration Certificate for Solar PV Teste The Seaward PV100 photovoltaic installation tester is the worlds first handheld multifunction tester specifically designed for use on PV systems.